Like yesterday's Rose 31, Bergamote 22 was created by perfumer Daphne Bugey for the Le Labo line, which recently launched in New York City. The fragrance features bergamot, petitgrain, grapefruit, nutmeg, orange blossom, aspic, cedar, amber, musk and vetiver. Bergamote 22 starts with a rush of dry spices not unlike the opening of Rose 31, but with lighter notes of citrus and orange blossom replacing the rose and deep woods in the Rose 31. I would swear there was a touch of cumin here too, and pepper as well, but neither are listed in the notes and I already established yesterday that I cannot necessarily identify spice notes correctly (and my spice cabinet is no help: I gave up cooking years ago and everything there has long since turned to odorless dust). At any rate, it is spicy, and there is a pale woody-musky base with just a touch of earthiness. It is more dry than sweet, and rather like a cross between The Different Company's Divine Bergamot and the early stages of Eau Pour Le Jeune Homme by Maître Parfumeur et Gantier. It has a summery character, but I wouldn't go so far as to call it transparent, and certainly it has more presence than the Divine Bergamote. I am wearing all three fragrances right now, and the Le Labo is giving the other two a run for their money: I might just need to own all of them. I would call it comfortably unisex — it is easily less masculine than Rose 31 — but Le Labo is marketing it as a men's fragrance. Le Labo Bergamote 22 is available in 15, 50, 100 or 500 ml. For buying information, see the listing for Le Labo under Perfume Houses. 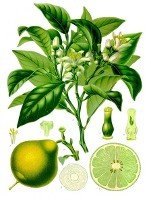 Note: image is Citrus bergamia from Franz Eugen Köhler, Köhler's Medizinal-Pflanzen, via Wikimedia commons. This sounds very, very interesting. I'll be in NYC for just a day and night in April for an art event. This'll give my nose something to do.